February 1905: London - Paris by balloon This Month... in 1905 Jacques Faure and his cousin Hubert Latham (left) flew from London to Paris by balloon. Faure had originally intended to steer the balloon, named the Aéro-Club 2, with twin propellers and a 7 hp engine but in the event a free flight was made. Having inflated the 4,650 cu.ft. 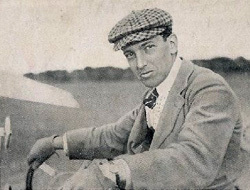 envelope, the aeronauts left Crystal Palace at 6:45 pm on 11 February and threw out ballast over Hastings at 8 pm to climb to 3,000 ft. for the Channel crossing. Having crossed Dieppe at 10 pm and seeing the lights of Paris on the horizon, they landed at Saint Denis at about 1 am, after 6 hours in the air. "The record of a London - Paris balloon trip has been made. It is now for others to break it," a justifiably proud Faure told reporters. A timeline of significant aeronautical events in Europe from the death of Otto Lilienthal in 1896 to the outbreak of war in 1914 (via the first man-carrying helicopter and more) has now been added. Hubert Latham - Murder in the Bush? Alberto Santos-Dumont - First to Fly?